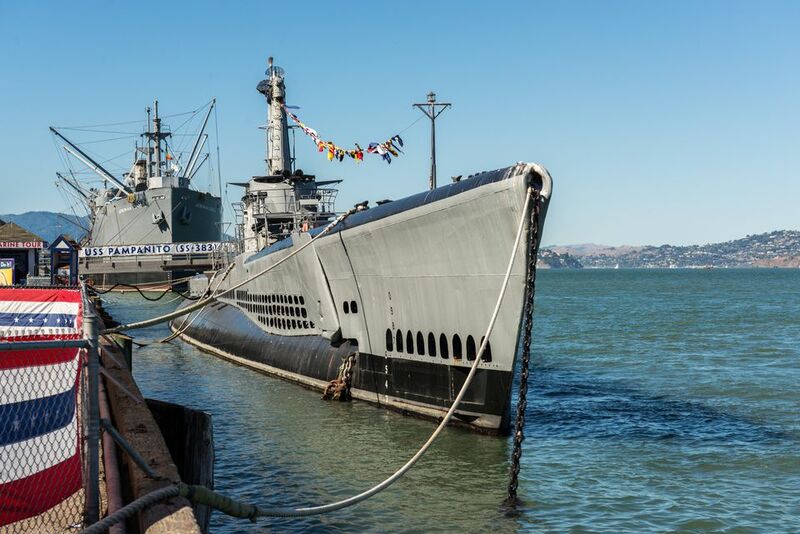 Situated in San Francisco's Fisherman's Wharf neighborhood, the USS Pampanito (SS-383) is a Balao-class submarine that today operates as a floating museum and memorial for the Navy's “silent service” (submarines). It's part of the larger San Francisco Maritime National Historic Park, highlighting Pacific Coast maritime history through numerous stand-alone attractions, including a bevy of historic vessels, a visitors center and a maritime museum. For a look into the Pacific's seafaring past, there's no better way to spend an afternoon. The diesel-electric powered USS Pampanito was launched into service on July 12, 1943 along the US East Coast, making her way across the Panama Canal en route to Pearl Harbor, where she arrived on Valentine's Day, 1944. Over the next couple of years she embarked on six individual war patrols — all in the Pacific Ocean — over which time she sank six Japanese ships, damaged four others, and owned six WWII battle stars. Badly damaged on her first war patrol, the submarine was later refitted and repaired at Pearl Harbor's Midway Island. After the war, the celebrated vessel proceeded to San Francisco, and was decommissioned at nearby Mare Island on December 15, 1945. Although it sat unused, the Navy maintained the Pampanito to be reactivated at any time. In April 1960 she was turned into a Naval training vessel at Mare Island Naval Shipyard, and continued in this role until 1971. It wasn't until 1975 that the Pampanito became a memorial and museum, first opening to the public in March 1982. The carefully restored vessel maintains its 1945 appearance and now hosts thousands of visitors annually, offering both self-guided audio tours and pre-scheduled docent-led tours led by docents. Along with San Francisco's SS Jeremiah O'Brien, it celebrated its 75th anniversary in 2018. The Pampanito is a National Historic Landmark moored at Pier 45 in the heart of San Francisco's Fisherman's Wharf, and self-guided audio tours begin on the Main Deck Aft, visiting everything from the vessel's torpedo room to its engine rooms, crew's mess and gallery, radio room, and pump room along the way. Various exhibits are set up throughout, with the audio providing various details of each as well as as first-hand accounts from former onboard personnel. The ship's still-working parts include its periscope, one torpedo tube, engines, and an onboard ice-cream maker. There's even a broom flying from her mast, representing that the submarine made a “clean sweep” of the sea's enemies. In addition to operating this historic vessel, the San Francisco Maritime Park Association also runs education programs for both children and adults that take place onboard throughout the year, including overnight stays utilizing the Pampanito's 48 bunk beds. There are also sea shanty sing-a-longs every first Saturday evening of the month aboard the Hyde Street Pier's fleet of turn-of-century ships, traveling exhibits viewable at the historic Maritime Museum just across the street from Ghirardelli Square in Aquatic Park — an Streamline Moderne-style structure known for its distinct sea murals — a massive library archive of maritime books, maps, and charts dating back centuries, and the San Francisco Maritime National Historic Park Visitor Center, located in the same historic brick cannery building as the Argonaut Hotel. The park hosts an annual Maritime Beer Fest each April, and offers exquisite views of Alcatraz, San Francisco Bay, and the Golden Gate Bridge all year long. Take a stroll along the park's circular Aquatic Park Pier (Muni Pier), or set sail on the park's historic scow schooner ALMA, a 1891 ship that's the last of her kind. The Hyde Street Pier Small Boat Shop offers an opportunity to witness traditional boat building and hands-on boat repair. Waterfront walking tours leave from the lobby of the Argonaut Hotel weekends at 10:30 a.m. In June 2018, Hyde Pier's iconic 1886 three-masted Balclutha tall ship has temporarily relocated to nearby Alameda for maintenance, but is scheduled to return in early 2019. The Pampanito is open to visitors daily. Call (415) 775-1943 for specific times. Located in the same historic building and adjacent to the San Francisco Maritime National Historic Park's visitor center, San Francisco's luxury boutique Argonaut Hotel is the perfect place for fully immersing yourself in the city's seafaring history. With its exposed brick walls, original timbers, and nautical fabrics, the property is overflowing with character and boasts the Blue Mermaid Bar & Restaurant, where seafood is the star and cocktails also boast their own maritime themes. For a true San Francisco treat wander over to Bistro Boudin, known for its legendary sourdough bread — especially its bread bowls, filled to the brim with either traditional clam chowder or crab & corn bisque. Or grab a seat at the bar and enjoy a legendary Irish coffee at the Buena Vista, right across the street from the Powell-Hyde cable car turnaround. If it's delicious seafood (think “line-caught” wild cod and seared Alaskan halibut) with waterfront views you're after, Scoma's has been a neighborhood favorite since 1965. Both the Powell-Hyde and Powell-Mason cable car lines offer direct access to Fisherman's Wharf, along with the historic F-line MUNI streetcar, which runs along Market Street from the Castro. Both the East Bay's Bay Area Rapid Transit (BART) and CalTrain (by way of the MUNI N-Judah) connect with the F-line in front of San Francisco's Ferry Building. There are public restrooms at Pier 39 and the end of Hyde Street at the waterfront, and an individual bathrooms at Bay and Taylor streets.